Try this variation of the familiar chilli con carne - it takes a little longer, but with its rustic flavours and cooling salsa, it's well worth the wait! Heat the oil in a large saucepan and cook the onion and garlic for 2-3 minutes until softened. Add the beef and cook until browned. Stir in the chilli powder, tomatoes and seasoning, bring to the boil, cover and simmer for 1 hour, stirring occasionally. Stir in the beans, cover and simmer for a further 30 minutes or until the beef is tender. Meanwhile, mix together the salsa ingredients and chill. Serve the chilli on a bed of Waitrose Basmati Rice, with a large spoonful of the salsa and garnish with coriander leaves. This chilli is fairly hot. For a milder version reduce the amount of chilli powder. 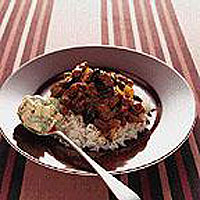 This recipe is also delicious made with British diced pork and chopped red and green peppers. Serve with salsa and roll up in warmed flour tortillas.